What's more hip than having your engagement portraits taken in a old historic downtown bank building turned studio and out and about around historic landmarks in beautiful Anchorage? NOTHING! This gorgeous couple contacted me about doing a session and had a studio session in mind at first I was hesitant only because I haven't photographed a engagement session in my studio and I wasn't sure exactly how I was going to plan it out. After Ryan contacted me with an idea and had sent over several bouquets of balloons, I had no worries! 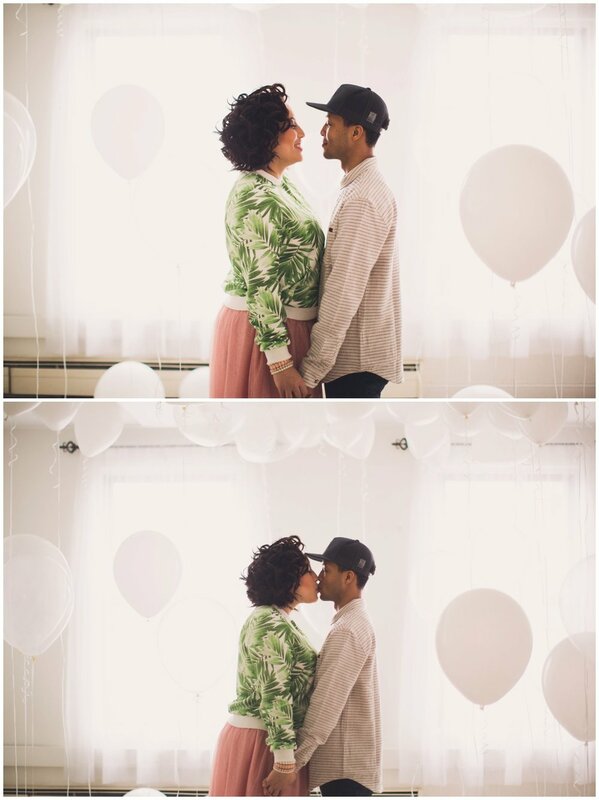 My studio was flooding in beautiful white and clear balloons and it was dreamy! Ryan & Joe had beautiful chemistry, the way Joe looked at Ryan was the sweetest and you could tell that they love to laugh together. Both work and live in the Downtown area so a Downtown engagement session was right up their alley. We first started in the studio and then headed out and around the corner to the 4th Ave Theatre where I had them practice dipping, haha. We had a great time and as you can see for yourself we had a successful engagement session! Here are a few of my favorites from the session, enjoy!